Did you know mains power is no longer needed for you to deliver your digital messaging? Opening up a whole world of new possibilities. 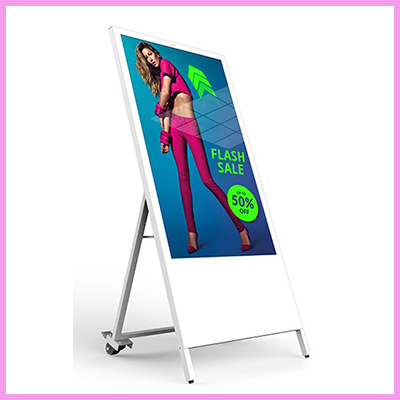 We would like to introduce you to the newly launched Portable Battery-Powered High Brightness Digital Signage Solution, the 49″ Digital Android Battery A-Board. Battery powered display – 12 hours running time and can recharge fully in 7 hours. Our A-Boards are in stock and available for immediate dispatch. Or to receive more information about this particular A-Board battery product please contact our sales team via email or call us directly on +44 (0) 1634 327420.